Denison Total Abstinence Union. Denison Friday Eve July 12, 1878. In the absence of the President and Vice President elect the meeting was called to order by R. Shaw Van who presided for the evening. Prayer was offered by Mr. E. S. Plimpton. Addresses by S. S. Wilkinson, Chas Tabor, N. F. Smith, A. C. Smith, [Mr?] Hamilton, W. N. Becker Jr. of West Side, F.W. Hact of Mt Vernon & others followed, the excercises being interspersed with singing by the choir. J. P. Connor, H.A. 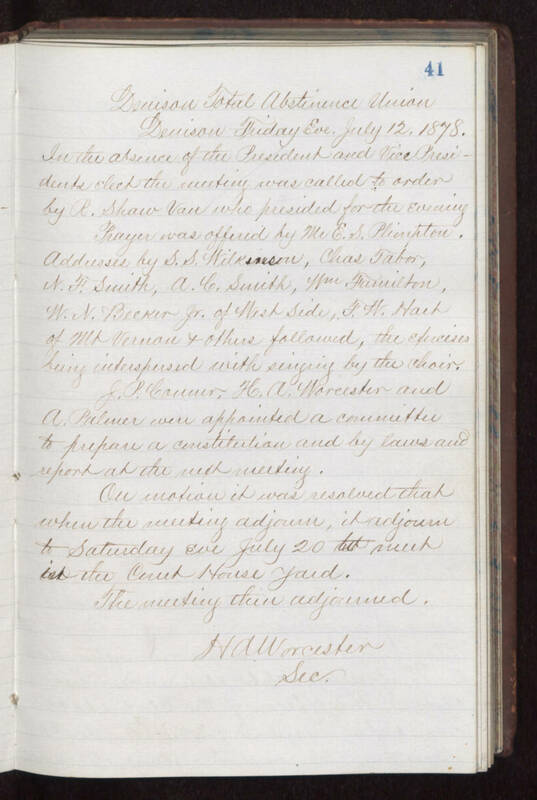 Worcester and A. Plamer were appointed a committee to prepare a constitution and by laws and report at the next meeting. On [illegible] it was resolved that when the meeting adjourn, it adjourn to Saturday Eve July 20th [such?] in the Court House Yard. The meeting then adjourned. H. A. Worcester Sec.